We are pleased to publish another SPERI Global Political Economy Brief – No. 8 in the series. The authors are John Mikler and Ainsley Elbra, both of the University of Sydney, and the title of their Brief is Paying a ‘Fair Share’: Multinational Corporations’ Perspectives on Taxation. 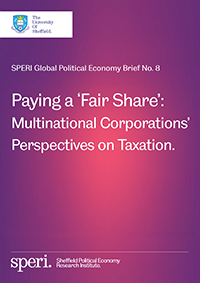 In the Brief Mikler and Elbra address the issue of global corporate tax avoidance and consider how multinational corporations (MNCs) can be made to pay their fair share of tax. They focus in particular on the strategies to avoid taxation deployed by Apple and Google and consider in depth the public enquiries undertaken in the United States, Australia and the United Kingdom into the methods of avoidance adopted. As the major headquarters for MNCs, including those most heavily implicated by their aggressive tax avoidance strategies, the United States must take the lead in regulating them to pay their fair share of tax at home and abroad.